If you play rummy and you love playing it online on Indian rummy websites, then you might have heard the name of RummyCircle for sure. They are in the business of providing online rummy platform to millions of players across the globe. The website is well reputed and is in competition with other good platforms like Ace2Three, Junglee Rummy, Adda 52 etc. In this article we will be reviewing and pointing out some of the best features that make this rummy website different from others. RummyCircle.com is owned and operated by Play Games 24×7 which later changed their name to Games 24×7 due to the warm welcome they got for their online rummy platform. The team consists of experts in rummy games who manage and support the whole website. RummyCircle.com offers its new players with a welcome bonus of Rs.1000 when they join and deposit cash for the first time. All the other promotions are based on tournaments and if you want to earn cash, then you will have to show your rummy skills. When you join them, you are placed as a club member that changes according to the deposit amount and winnings. Silver, Gold, Diamond, Platinum and Platinum Elite are some of the clubs you will be in when you start depositing. The higher the amount you deposit, the higher will be your club status. To know more RummyCircle Club Promotions, click here. When you register with RummyCircle.com, you can join Welcome Tournament which entirely Free to join. A new player can win up to Rs.600 in this tournament. The other tournaments are Mega Rummy Tournaments and Reward Points Tournaments. In order to take part in Mega Rummy Tournament, you need to participate in the qualifiers that are scheduled every day of the month and get a ticket to reach finals. A total of up to Rs.1 lakh in cash prizes is what’s awaiting the winners. Reward Points Tournaments are held 3 times a week – Tuesday, Wednesday and Friday. It is your chance to redeem those reward points for a ticket to win huge cash prize up to 4.9 lakhs. Other rummy tournaments from RummyCircle include All or None tournaments which will reward you with cash prizes worth Rs.5 lakhs as well as a bonus that is 6 times your entry fee. But, if you lose, you will lose your entry fee as well as your chance to rejoin the tournament. 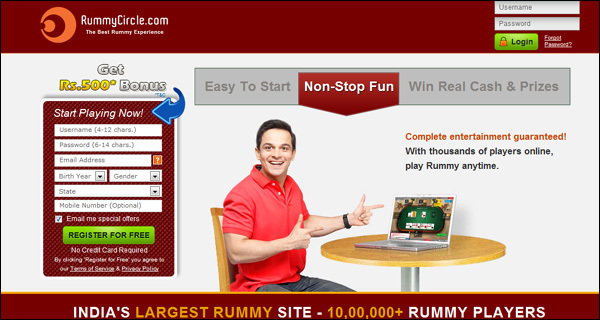 Also, Check out another Rummy Circle Review to understand more about Rummycircle website. All the new players joining RummyCircle can claim a bonus of Rs.1000 on their first deposit as Welcome Bonus. That’s not all! Players will have more opportunities on weekdays to grab extra cash on their deposit with bonus offers like Supreme Bonus (20% bonus) and on Fridays with Friday Bonus (15% bonus). If you play cash rummy games, you will also be entitled to grab a good bonus that depends on your club level. If you reach club level Platinum Elite, you can get a bonus of 50% up to Rs.3000 on deposit which is one of the best in online rummy industry. The promotions, bonus offers and tournaments that RummyCircle offers to its players are tempting, especially the tournaments. If you have already played in this online rummy website, let us know your views on the same in the comment section below!